When you take a private jet charter to Napa Valley with JetOptions, you can fly directly to the Napa County Airport APC /KAPC. Located south of Napa it’s an easy commute of minutes on to wine country. This airport has a full-service FBO with a terminal, fueling and comprehensive aircraft maintenance, ground transportation, limo, and town car services. West of Napa in Marin County are the cities of Novato with Gnoss Field / KDVO, and the Petaluma Municipal Airport / O69. Further north along Napa’s wine trail are the towns of Yountville, St. Helena, and Calistoga. The next group of nearby airports are east of Calistoga and are the Angwin-Parrett Field /203 and Pope Valley /05CL; there’s even a seaplane airport at Lake Berryessa /E20. If you are really looking to get away, you can fly to Mysterious Valley Airport / 20 CL, and land – but only with permission. One of the great things about Northern California’s wine districts are the wildly distinct varieties of grape that grow in close geography. 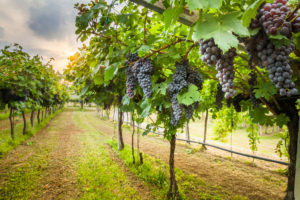 Napa Valley is, of course, famous for Cabernet Sauvignon, and you can travel slightly West to Sonoma County’s growing wine districts and experience Cabernet, Chardonnays, Pinot Noir, Merlot, and Zinfandel. You can fly direct into Santa Rosa and land at the Charles M Schultz Airport /KSTS, named after the famous author of Peanuts and most famous resident. Further north along the 101 is the Cloverdale Municipal Airport / O60, and the Alexander Valley wine growing region extends north from the town of Cloverdale. Travel without limits by private jet! 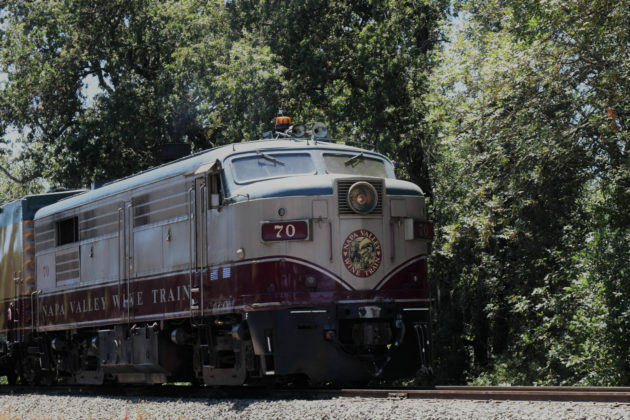 Take a private plane to Napa, and you’ll enjoy scenic views when you take the Napa Valley Wine Train. This three-hour ride allows you to have gourmet lunch or dinner as you fly by town centers and wineries in Napa, Yountville, Oakville, Rutherford and St. Helena, all seen through large windows. There’s even a seasonal open-air car called the Silverado car so that you can feel the Valley Breeze, On the Tasting Car you’ll find 30-40 boutique wines, and you can sample wine flights. The train includes ten cars total with 140 seats, is fully restored and leaves from downtown Napa, traveling north. Visit the Auberge du Soleil restaurant in Rutherford when you take a private jet charter to Napa Valley. From the restaurant, you’ll find breathtaking views of the valley below as you’re enjoying the best food available in Napa Valley. Fly a private jet to Napa Valley and visit the CIA—not the intelligence organization, but the Culinary Institute of America. There you’ll find the sustainable farm to table cooking at the huge campus, where many famous chefs have gotten their start. You can take courses, attend a tasting and explore retail stores and public restaurants. Of course, when you take a private jet charter to Napa Valley, you must go on some wine tours. Each winery is different, and with more than 400 in the region, you may select them based on where you’re staying. Other choices are made based on the length of your stay, or what type of experience you want. For example, do you want to go on wine cave tours, barrel tasting or enjoy food and wine pairings? 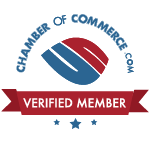 Many wineries are only open to current members or have an advance registration schedule. With some legwork, an amazing tour comes together. Highlights include the Raymond Vineyard and Cellar in St. Helena. At the Crystal Cellar, you’ll find a stainless steel walled tasting room with a mirrored bar, where you can enjoy wine from beautiful crystal decanters. Take in the distinct wine aromas as the winery’s Corridor of the Senses. The Quixote Winery off the Silverado Trail in Napa hosts stunning architecture, as well as great petite syrahs and cabernets. A famous winery that is a must visit is the Robert Monday Winery barrel room in Oakville. You can enjoy a 90-minute experience that includes an exploration of the vineyards and cellars, as well as sit-down tastings. This winery, like 95% of wineries, is family owned. For a more contemporary experience, visit the Caridean Estate in St. Helena for one of the newest wineries, offering 23 different wines. Explore more private jet destinations in our series. Los Angeles, San Diego, nearby San Francisco or Southern California by private plane. Visit California Wine Country with a JetOptions Private Jets charter services for Wine Country. Call or email us today!